There are odd rants about God on the Internet. You find a funny religious tract lying on a table in the coffee shop. A guy standing on some box at a downtown corner preaches out loud gawd only knows what to whoever will listen. Normally, you don't pay attention. You just tune it out. It's meaningless and insignificant; it's not worth your time. It's just part of the background noise of life. But what if those odd, somewhat religious, occasionally illogical statements were coming out of the mouth of a candidate running for office, even running for the president of the United States? Would you ignore it? Would you find it funny? At what point would you think to yourself, "Holy crap. This is no longer a joke; this is serious. This person may have a chance, a real chance of ending up in the White House." Ms. Goldberg writes: "Put simply, Dominionism means that Christians have a God-given right to rule all earthly institutions." This statement is startling and just a tad hard to believe. In fact the author goes on to point this out by saying that "ordinary people" call her and others writing about this as paranoid. However, Ms. Goldberg comes to the table with quite a degree of authority on the subject being the author of the book "Kingdom Coming: The Rise of Christian Nationalism", her thorough firsthand reporting of the Christian right In America. For a long time, I have heard people make the statement that Christianity has been one of the most imperialistic movements throughout history. It would seem that Ms. Goldberg is pointing out a worrisome recrudescence of this imperialism however this time; it is making its way into mainstream politics. For a country which supposedly promotes the idea of the separation of church and state, there are many within its ranks who believe otherwise. Stephen Colbert, an absolutely hilarious caricature of the Conservatives once said on his show, "I support all religions like Muslims, Hindus and Buddhists. After all, there is more than one way to Jesus Christ." Even though I laughed, I did recognise a truth in what he said, that is, deep down, Christian fundamentalists believe they are right and everybody else is wrong. It almost goes with the territory. If you believe in something, truly believe in something, don't you want everybody else to have the benefit of the miracle you have? Gosh, I'm so enthused right now; I could jump up and down on Oprah's couch, not to make a reference to anybody else who may have bought too far into their beliefs. The problem, as Michelle Goldberg pointed out, is for ordinary people to take any of this seriously. I have said it before that Sarah Palin and now Michele Bachmann, two good looking women who are very photogenic, open their mouths and all of their credibility vanishes within two seconds. The two of them have uttered such absurd statements, that to this day I am waiting for them to stop, laugh, then say, "Okay everybody. I was just joshin' ya. Now I'm going to tell you the real stuff." What is truly scary in the rest of Ryan Lizza's article is his discussion of the machine in place to try and get Michele Bachmann to the White House. It isn't a question of whether Bachmann is the right person or not, it is a question of playing the "game" and winning the "game". The testing of Michele's new tagline, " Barack Obama will be a one . . . term . . . President! ", planning on media coverage, how to do interviews, etc., are all steps in playing the game and getting their candidate to win. Just think about what I just said. The goal is not to do the right thing. The goal is not to elect the best president. The goal is to win. Period. Matt Taibbi has written some terrific investigative pieces for Rolling Stone magazine and continues his quality reporting in his July 22, 2011 article entitled "Michele Bachmann's Holy War". He starts with the tagline, "The Tea Party contender may seem like a goofball, but be warned: Her presidential campaign is no laughing matter." Mr. Taibbi describes a woman who is a religious zealot who has both divine visions and paranoid delusions. While you may say that this indicates Taibbi's hostile approach to reporting on Bachmann, he goes on to factually report what Bachmann has said and done. Michele hangs herself and she's been hanging herself over and over again. The true surprise is that she has a following. She, like Sarah Palin, has indicated so clearly and so repeatedly that she hasn't got the slightest idea of what she's talking about outside the realm of her own mind, it is hard to fathom how anybody could take her seriously never mind vote for her. But since some people are following her and those people will vote for her; there is the nagging question about just who these people are. Michele Bachmann's greatest hits in just under 3 minutes - featuring presidential campaign footage and special guest Tim Pawlenty! One can only hope that Bachmann herself is so far right, she ends up being too radical for the Conservatives themselves: too right for the right. It's not just her religious fanaticism which is worrisome; it's that she, like Sarah Palin, is just plain dumb. The picture of the Statue of Liberty holding a cross instead of a torch is in front of the World Overcomers Outreach Ministries Church in Memphis, Tennessee. Dominionism, in the context of politics and religion, is the tendency among some politically active conservative Christians to seek influence or control over secular civil government through political action, especially in the United States. It is also known as subjectionism. The goal is either a nation governed by Christians, or a nation governed by a conservative Christian understanding of biblical law. The use and application of this terminology is a matter of controversy. Christians typically interpret this verse as meaning that God gave humankind responsibility over the Earth, although theologians do not all agree on the nature and extent of that "dominion". Michele Bachmann and Rick Perry aren't just devout—both have deep ties to a fringe fundamentalist movement known as Dominionism, which says Christians should rule the world. Whenever I talk about the growing power of the evangelical right with friends, they always ask the same question: What can we do? Usually I reply with a joke: Keep a bag packed and your passport current. I don’t really mean it, but my anxiety is genuine. It’s one thing to have a government that shows contempt for civil liberties; America has survived such men before. It’s quite another to have a mass movement—the largest and most powerful mass movement in the nation—rise up in opposition to the rights of its fellow citizens. The Constitution protects minorities, but that protection is not absolute; with a sufficiently sympathetic or apathetic majority, a tightly organized faction can get around it. Michelle Goldberg is an author and senior contributing writer for The Daily Beast/Newsweek. Her first book, the New York Times bestseller “Kingdom Coming: The Rise of Christian Nationalism” (WW Norton), delved into some of the reddest precincts of the United States to expose the ascendant politico-religious fundamentalism dominating the Republican Party and, at the time, the Bush administration. In a starred review, Publishers Weekly called it “an impressive piece of lucid journalism…carefully researched and riveting.” It was a finalist for the 2007 New York Public Library Helen Bernstein Award for Excellence in Journalism. The transformation of Michele Bachmann from Tea Party insurgent and cable-news Pasionaria to serious Republican contender in the 2012 Presidential race was nearly complete by late June, when she boarded a Dassault Falcon 900, in Dulles, Virginia, and headed toward the caucus grounds of Iowa. A plan to build a mosque near the Ground Zero site in New York generated quite a bit of controversy. 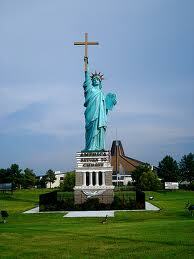 People have been jumping on the bandwagon saying that this is offensive to America in light of the events of 9/11. On July 19, Sarah Palin, on the social networking site Twitter, wrote asking "peaceful Muslims" to "pls refudiate" the plan. She then corrected herself by then calling on "peaceful New Yorkers" to "refute the Ground Zero mosque plan". Well, refute isn't quite right either and while repudiate might fit, reject would probably be better but by then, it was too late. The rest of the world got a hold of this and have both savagely and delightedly gone after her for this "creative" use of the English language. Sarah Palin has been putting out the following message: Barack Obama and the Democrats are going to institute the largest tax increase in the history of the United States, an amount of $3.8 trillion. Is this true or not true? Joseph Curl of the Washington Times wrote, "Soon-to-be president Michele Bachmann swept off with the top prize, but only after eating her body weight in corn dogs." ... Congresswoman Michele Bachmann won the Iowa Straw Poll with 28.6%. ... 71.4% of the voters did not pick Michele Bachmann. Appearing on "Conan" Monday night, Griffin recalled the time she met Bachmann in Washington while researching for her rally to repeal Don't Ask, Don't Tell. Perhaps mistaking Griffin for someone else, one of Bachmann's staffers pulled out a video camera to capture their interaction for her website. First, Griffin says she asked the Congresswoman if she'd support an effort to repeal the law that banned homosexuals from the military. When Bachmann declined, Griffin got personal. "Congresswoman Bachmann, were you born a bigot or did you, like, grow into it?" she asked -- on tape. "That's a good question. I'm gonna have to get back to ya," she said, perhaps not creating the best of campaign slogans. this is a sick sick woman. not to be confused with all the sick sick men who are just as brain washed as the next. when will people stop hating?